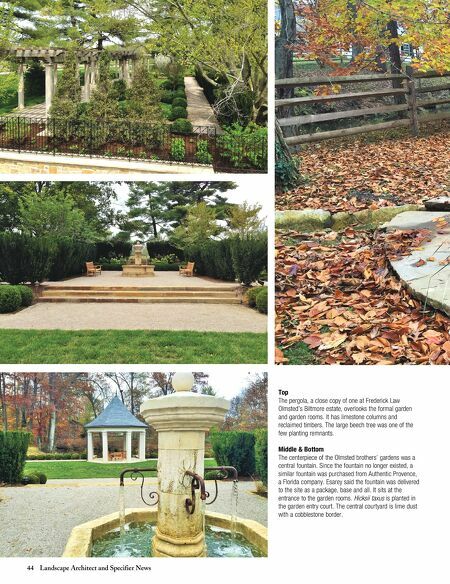 44 Landscape Architect and Specifier News Top The pergola, a close copy of one at Frederick Law Olmsted's Biltmore estate, overlooks the formal garden and garden rooms. It has limestone columns and reclaimed timbers. The large beech tree was one of the few planting remnants. Middle & Bottom The centerpiece of the Olmsted brothers' gardens was a central fountain. 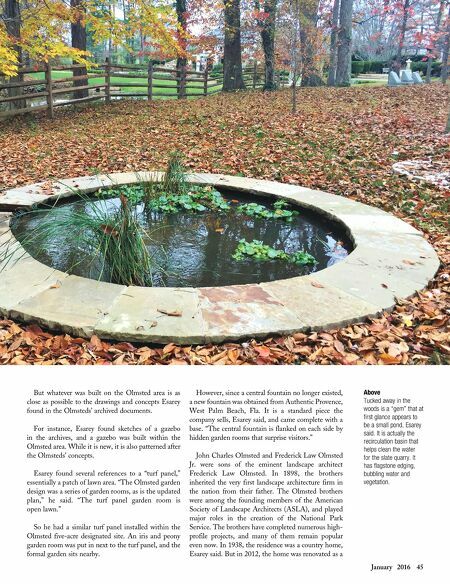 Since the fountain no longer existed, a similar fountain was purchased from Authentic Provence, a Florida company. Esarey said the fountain was delivered to the site as a package, base and all. It sits at the entrance to the garden rooms. Hicksii taxus is planted in the garden entry court. The central courtyard is lime dust with a cobblestone border.